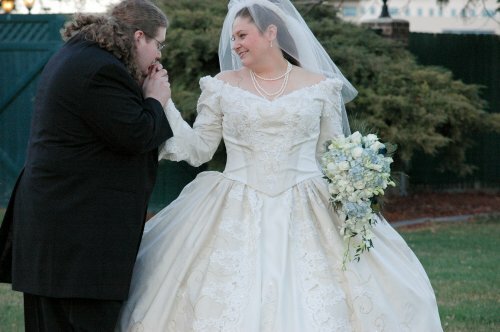 We started dating in late 2002, and on March 29th, 2008 we finally got married.&bsp; In the 10 years since we first met I've put on about 100 pounds (just like my mother did when she was my age - go figure! )&bsp; He thought I was beautiful when I was thin, and he thinks I'm beautiful now that I'm fat.&bsp; Bradon's about the same size he's always been, and just as gorgeous to me as he was when we met all those years ago. Bradon is my beloved, my partner, my hope, and my home.&bsp; I love him unreservedly, and I am so lucky to have him...and I think he's pretty lucky, too.